Are We Entering an “Everything Bubble”? Since the Great Recession bear market bottom in March 2009, the S&P 500 stock index is up a jaw-dropping 300%. In addition, the index is approximately 80% higher than its 2007 peak. Housing markets have also made a full recovery. The Case/Shiller National Housing Price Index is about 10% higher than the peak reached in 2006. The extraordinary monetary stimulus by the Federal Reserve, including seven years of zero interest rates and three rounds of quantitative easing, have pushed all the asset prices to very high levels relative to their fundamentals. We are in danger of entering an “everything bubble”. U.S. stocks are at all-time highs and the valuation has become very expensive. The widely-followed cyclically-adjusted price-earnings ratio (Shiller PE) reached 32.3, almost twice as much as the historical average of 16.9 (see Figure 1). The current PE level is pretty much the same as that preceded by the market crash in 1929. Although it is still lower than the levels during the Dot Com bubble, the current high valuation has become a little extreme and it is not unreasonable to say we are in the bubbly territory. Historically, the most severe market downturns started with extreme market valuations (see “3 Worst Bear Markets Started with High PE”). We should expect the next bear market will be very severe when it finally comes. The housing market is close to a bubble level again. The Case-Shiller National Home Price Index has exceeded the peak of the prior housing crisis by about 10%. The housing affordability measured by the ratio of Case/Shiller Home Price Index and US Median Annual Income has reached 4.5, which means currently the average home price is 4.5 times of median annual income. This level is much higher than the historical average of 3.7. At the peak before the prior housing crisis, the average home cost roughly 5 times the median annual income (see Figure 2), we are getting closer to that bubble level. Corporate credits are also close to a bubble level. The Bank of America Merrill Lynch High Yield bond credit spread, which measures the premium over Treasuries a low-quality company has to pay in order to raise capital, has declined to 3.4%. The average spread is much higher at 5.7%. Another troubling sign in the credit market is the re-surge of the CDOs (collateralized debt obligations), the very complex securities that almost brought down the financial system during the Great Recession. The total issuance of CDOs in 2017 reached $150 billion, according to Asset-Backed Alert. Although the issuance amount is lower than that during the housing bubble, it indicates the speculative and reckless behaviors are coming back into the system. Stocks, housing and credits have all become very expensive and we are definitely entering into an “everything bubble” if we are not in it now. We all know that every bubble will burst eventually. The root cause of the bubbles are mostly loose monetary policies. When cheap money is pumped into the financial system, asset prices are inflated as a result. 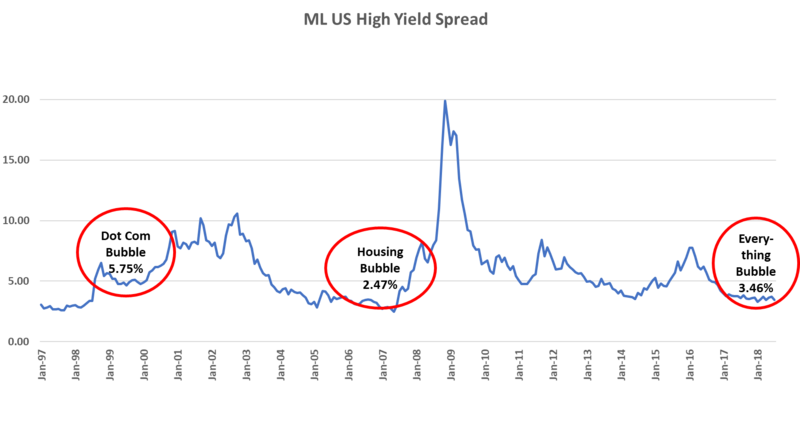 Historically, the catalyst for bubble burst was rising interest rates (see Figure 4). In the current cycle, the Fed started raising interest rates in December 2015 from zero percent at a measured pace. So far, the Fed is in no hurry to deflate the asset prices because inflation rate remains benign. Therefore, we expect this “everything bubble” may inflate more before the next downturn, which could be very severe.